An era comes to an end. Ever since the start of the industrial revolution, mankind could only produce more, using more. Produce more food from more land. Produce more consumer goods from more resources, processing more ore that required more land to mine it. Using ever more fossil fuels, shipped in ever growing quantities to the world’s industrial centres. But the advent of precision will put all this to an end. We will be going to produce more, using less. This is the fourth article in a series on the forthcoming book by Alle Bruggink and Diederik van der Hoeven: More with Less, Welcome to the Precision Economy. The articles appeared on 30 October and 2 November 2016, and 24 January, 14 February, 18 March and 30 March 2017. Precision will allow us to produce more, and better products, from less resources. It will allow companies to transform their entire feedstock into products and earn more from it. It will allow companies to produce less and less waste and thereby protect them from paying levies on those wastes. It will allow companies to make better products, with better functionality, better tuned to the needs of the customer. Companies will make more profit and reduce their environmental footprint. 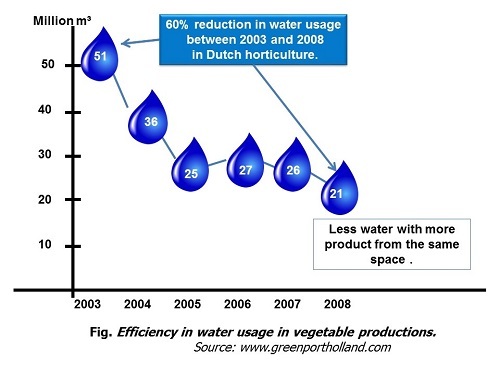 Precision in action: water consumption in Dutch greenhouses. With precision equipment, surgeons exactly locate the tumour in the body; using precision non-invasive surgery, they cause the least disruption possible. Similarly, geologists can locate the ore precisely, and devise mining strategies that disturb as little as possible the environment. Shallow ores like clay are mined from a computer model of the soil; the machines mine just the ore and nothing else. Chemical scientists develop a ‘green chemistry’, much more precise than the old brand; it moves away from oil and gas, requires much less energy and pressure and produces hardly any waste. Energy production itself becomes ever more precise, greatly reducing its needs for materials year after year. Precision surface treatments allow us to deposit very thin layers on surfaces, just a few atoms in depth, and make engravings or patterns in these deposits, very important for the development of solar cells and electronic equipment. Nanotechnology allows us to improve properties of materials with just the slightest of additions. Precision agriculture produces better yields while reducing inputs of fertilizer, pesticides and herbicides (and the environmental pollution that would result from them). Precision technologies greatly reduce environmental pollution. With these, we will even succeed in making new materials while preserving nature’s complexity, starting from resources in living nature. Precision will develop into the holistic treatment of natural resources. 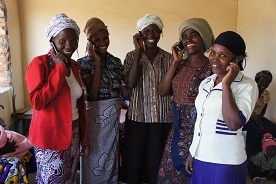 Developing countries could leapfrog to precision technologies – as they leapfrogged the landline and went directly to the cell phone. Such technologies are not just for the industrialised countries; rapidly developing countries could leapfrog to them. With them, companies can produce exactly what the consumer wants and nothing else. And precision is not just in technology: our society moves towards it in its use of hardware – from private towards shared ownership, from possession ‘forever’ towards possession just if and insofar as needed; ‘social precision’. Precision is the key to a new era that will produce wealth for more people, more satisfaction to the consumer and much less waste. True, we do not live in such an economy yet. But we’re moving there, and swiftly. That’s because many precision technologies have recently come to maturity or will do so in the next few decades. It’s their combination that will make all the difference in the world. Let’s take an example and have a closer look at non-invasive surgery. New observation methods allow us to locate precisely the tumour (or any other malfunction) in the body. An explosive growth of computing power allows us to process the data from those observations. Better communication technologies allow us to show these data on any desired screen anywhere in the world. These ICT technologies even allow us to perform long-distance surgery, if so desired. Miniaturisation of instruments allows us to access the precise location of the tumour and make just the incisions required. Robots will be able to perform routine operations during this process. New materials will help us to ease the effects of surgery: biodegradable plastics that will be absorbed in the body. In short, it’s only through combination of a great number of precision technologies that we can develop non-invasive surgery. And likewise, it’s only through combination of a great number of such technologies that we can enter the new economic era that we might call the precision economy. The case of tomatoes in the Netherlands further illustrates our point. They used to be mass produced, more with an eye on costs than on quality, and they came in one size and one colour: perfectly round and bright red. Around 1990, German consumers got weary of them, starting to call them ‘water bombs’. At the same time, Dutch government could no longer maintain low gas prices for greenhouses. Threatened from two sides, Dutch horticulturalists embarked upon an innovation wave that would turn them to the world’s leaders. Several precision technologies played a key role in this transition. New plant breeding methods (GM-led but traditionally bred) produced new tasty varieties like the clustered tomato, the beef tomato and the cherry tomato. These methods also produced varieties resistant to common diseases like the tomato mosaic virus, mildew, botrytis and fusarium. Predator insects control pests like whitefly, thrips and spider mites. Horticulturalists make use of these predators only if and insofar as they observe these pests. Precision methods based on pheromones control pests like tuta absoluta. The combined effect of these practices is a continuous reduction in the use of chemical pesticides; the aim is to reduce this to zero. Sensors continually monitor tomato plants and fruit; they report greenhouse climate and lighting conditions, growth patterns and ripening; they signal any irregularities like bruising, insect attacks and discoloration. Dutch horticulturalists reduce energy use in an ambitious program called ‘The greenhouse as an energy supplier’. This includes strategies like precision lighting and growing patterns tuned to energy use; and measures like better CO2 supply and ground-source heat pumps that heat ground water in the summer and extract the heat in winter. And on top of that, the sector embarked on an ambitious program of water use reduction by drip irrigation and water recycling in closed greenhouses. 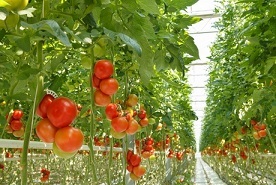 Traditional Dutch greenhouses used 22 litres of water for the production of 1 kg of tomatoes; this has now been reduced to just 4 litres. Contrast that to Spain and Israel: 30-60 litres. In sum, Dutch horticulturalists succeeded in producing more with less: better tasting tomatoes, using less energy, less water and less pesticides. In short, Dutch tomatoes have a much lower footprint than 25 years ago. And in 2012, the Netherlands became the main tomato exporting country in the world, leaving behind it Mexico, the home country of the tomato. Dutch tomato exports then amounted to € 1.4 billion. Together with their Flemish colleagues, who followed a similar development pathway, the Dutch now dominate the important and quality sensitive German market. The advent of similar methods in the open field is just a matter of time. In sum, we submit that precision will conquer the world. Because such activities have an overriding logic: they produce more profit and reduce the footprint.